“Now there were in the church that was at Antioch ...” The church at Antioch was a separate assembly of believers than the church at Jerusalem. The church at Antioch was autonomous and independent of any other church. “… the Holy Ghost said ...” The Holy Ghost spoke to the church at Antioch audibly. The Holy Ghost did not use an intermediary of any kind. There was no bishop telling the church anything, there was no denomination headquarters, or church hierarchy, in the process at all. There was no universal church mentioned or implied. “And when they had fasted and prayed, and laid their hands on them, they sent them away.” The local church at Antioch obeyed the Holy Ghost. After prayer and the laying of hands on Barnabas and Paul they sent them away. There was no denominational headquarters, or another church, or a bishop, or other church hierarchy involved in the process. The”work” is to start new independent, Bible believing, doctrinally correct, soul-winning, autonomous churches that are indigenous. Nowhere in the New Testament was a universal church, a denomination, a church hierarchy, started by the Apostle Paul or any other Apostle. The church at Antioch was the home church of the Apostle Paul and Barnabas. The so-called “universal church,” or a recommendation from all of the other churches, or a denomination, or a church hierarchy, did not recommend Paul and Barnabas for the work of missionary evangelism that they fulfilled. The local church is the only authority for sending out missionaries for the work of evangelism in the world. The work that the Apostle Paul and Barnabas fulfilled is clearly written in Acts 13:4 to 14:25. The Apostle Paul and Barnabas left the area of the church traveled to different Gentile cities, preached the gospel, had converts to Christ, taught the disciples, confirmed that the disciples believed the correct doctrines of the scriptures, ordained men to pastor the different churches, and established indigenous churches. Not one time did Paul and Barnabas establish a church hierarchy of any sort, including a “universal church,” or establish a bishop or other church hierarchal organization to control the individual churches. All church denominations, bishops controlling several churches, and the concept of a universal church, are man-made organizations. Even though there were other churches already in the area, only the brethren at the church at Antioch were assembled together to listen to the report of Paul and Barnabas. So, it is very obvious that only the local church in the area of Antioch assembled to hear the two missionaries. The conclusion is obvious. If there was a “universal church” than the other churches in the area would be assembled all together. Therefore, there the meaning of “church” can only be meant to be local in the area. Any other meaning is not possible. The meaning of “communicate” in the context of Philippians 4:14-16 is clearly helping financially and not just verbally. The local church at Philippi made the decision to support the Apostle Paul with financial gifts to help him in his financial needs. This decision was made at the local church level and not by a denomination, a mission board, a para-church organization, of some bishop outside the local church. It is also very obvious that a “universal church “ was non-existent in the process of helping the Apostle Paul and his financial necessities. As with the Old Testament, the willingness by the hearers of the gospel, through the giving of their tithes and offerings, provided the financial necessities of God’s work. After the local church at Antioch recommended that the Apostle Paul start a second missionary journey Paul chose Silas to go with him. The only church involved in the process of recommending Paul and Silas to journey as missionaries was the local church at Antioch. There were no other churches, or a universal church, or a denomination, or a bishop over the churches, or any church hierarchy, in the process of recommending the missionaries. The Lord Jesus is the Chief Shepherd of the individual, local churches. The pastor is the under-Shepherd of the individual, local churches. The pastor is the visible head of the local church and the Lord Jesus is the invisible head of the local church. As in the individual family, the local church is only in subjecttion to Christ and is not to be in subjection to any man outside the local church. “For the husband is the head of the wife, even as Christ is the head of the church: and he is the saviour of the body.” Ephesians 5:24 As with the family, the husband is the head of the family and any other individual that attempts to be head of the family is the one that is causing disorder in the family. As with the 7 churches in Asia, the Lord Jesus is the Chief Shepherd of the individual, local, New Testament churches. The pastor is the under-Shepherd of the Lord Jesus Christ and is the visible authority of the local church. As we see in the example of scripture, the only authority to send out missionaries resides in the local church. The pastor of an individual, or local, church is the final visible authority in sending out missionaries to the foreign field to preach the gospel. Ever since the start of the Roman Catholic Church denomination, the various denominations created a hierarchy in sending out missionaries to preach the gospel. Instead of the pastor being the final authority of the local church, a denominational headquarters becomes the final authority. The supplanting of the authority of the pastor of the local church as the under-Shepherd of the Lord Jesus Christ, and the leading of the Holy Spirit, is the objective of the every denomination starting from the Roman Catholic Church to our day. Also, in these last days we are witness to the rise of, “The Ecumenical Movement,” as a method to supplant the authority of the pastor as the head of the local church and the Lord Jesus as the invisible head of the local church. In order to accomplish this corruption of the local church, the leaders of the denominations are banding together in “Church Councils” and using Acts 15:1-30 as a pretext. The primary reason for the doctrine of “The Universal Church,” is the supplanting of the authority of the pastor of a local church and placing the authority of the local church to a denominational headquarters. All of the leaders of the denominational churches want to be “lords” over God's heritage. 1. A denominational school, or seminary, teaches the doctrines, practices, beliefs, traditions and ceremonies of the denomination. As the individual goes through the denominational school, he is also taught that only his denomination is correct and that those churches not in agreement with their doctrines are heretical. The school also creates an ill-feeling towards those churches who are outside of the authority of the denomination. 2. A denomination will create a system of professors and pastors who will spend the vast majority of their time writing books that promote their doctrinal beliefs. This includes the writing of “Church History” books that promote the denominations history and belittle, twist, begrudge, slander, local church history and Baptist church history. The man of God needs to realize that God only preserved the scriptures. God did not preserve a record of the true history of the church. All, may I repeat all, of the denominational “Church History” books are written by professors who are more loyal to the denomination than to the truth. 3. All of the denominations will eventually have a retirement program for the professors and pastors. If a pastor, or professor, forsakes the loyalty of the denomination than he forfeits his retirement. The retirement program makes the pastor, or professor, loyal to the denomination and not to the scriptures. 4. All of the denominations will have a system of bishops, or elders, or chain of command, over the pastor of the church. The local church at Antioch recommended Paul the Apostle and Silas to proceed on a second missionary journey and not some, “universal church,” denomination, a bishop that is over more than one church, or other church hierarchy. A true New Testament church will follow the example of the church at Antioch. Well done Alan, I wouldn't change a word of this lesson. The thought you put into this is very obvious, correct and something that most lessons on the local church do not teach. They might correctly teach against denominations and hierarchies, but never attain the depth you have here. Thank you for the kind words. Your posting is an encouragement to me. I will follow your advice and not change a word. Paul clearly stated, “Also of your own selves shall men arise, speaking perverse things, to draw away disciples after them.” As I speak, Charismatics, the Jehovah's Witnesses, the Mormons, Calvinists, Progressives, and even men claiming to be independent, fundamental Baptists, will enter local assemblies, or spew out their perverse teachings on the internet, and teach false doctrines in order to corrupt the local assembly and draw people out of the local church to their own church or entice them to be a part of their audience on the internet. 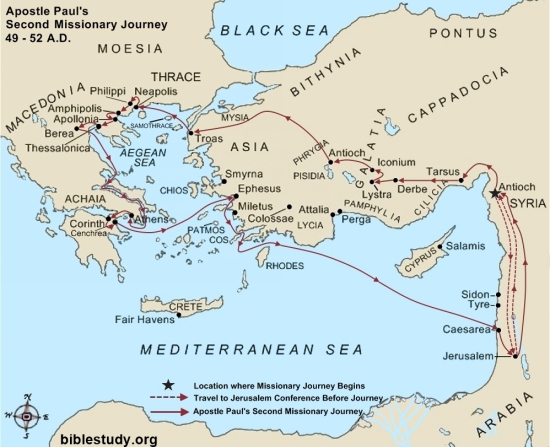 At the start of the second missionary journey of Paul the Apostle with Silas, went to the regions of Syria and Cilicia confirming the “churches.” The scripture is very clear that it is not just one church but more than one: 'churches' The accepted definition of “The Universal Church” is an invisible assembly of all the saved. Quite clearly, Paul and Silas did not confirm “The Universal Church” in any sense of the word. Therefore, the Apostle Paul and Silas did not confirm “the universal church,” but they confirmed several individual, local assemblies, or churches, of the saints. i “Confirming” Webster, Noah American Dictionary of the English Language. 1828. Cincinnati, OH: C.J. Krehbiel Company, 2000. This was spot on Alan. I especially liked the last three paragraphs. This lesson really tore apart the "Universal Church vs Local Church" issue. This is one thing I have always driven home when teaching about the institution named Church. And that is that when Scripture talks about more than one church, it always says "churches", it never lumps them together to indicate them as one Universal church. The word "churches" in these verses positively identifies that the word being in the plural affirms that there was more than one local church. The act of Paul "confirming" the churches is exactly correct in indicating how mission works are to be "confirmed" by their sponsoring church. I consider this of paramount importance before any mission work is to be formally organized. It is a grave mistake to just turn a missionary loose and just "rubber stamp" his work without first making sure it is a solid work, ready to be organized into a New testament Church. Thank you for putting this up, it is reassuring to hear these critical truths being taught today. After traveling north from their home church in Antioch, Syria, The Apostle Paul and Silas continued preaching the gospel and establishing churches in Cilicia. In Cilicia they turned westward towards they region of Galatia and Asia (Minor). Chapter 16:1 finds them in Derbe were they encounter a young man, Timotheus, or Timothy, that will have a profound impact on the gospel in the life of the Apostle Paul. “…they delivered them the decrees for to keep, that were ordained of the apostles and elders which were at Jerusalem.” A New Testament church is a continuation of the first church established by the Apostles and Elders in Jerusalem. A true New Testament church will follow the decrees, the methods, the practices, and the doctrines of the apostles as written in the scriptures. The denominations, and or churches, and or Para-church ministries, who deviate from the decrees, practices, methods, and doctrines of the scriptures, are not New Testament churches. “And so were the churches established in the faith, and increased in number daily.” As the Apostle Paul and Silas traveled churches were established in the faith and increased in number. Although the number of churches, or local assemblies of believers, are not recorded, the scripture is very clear that they were numerous and local, and independent of any denominational authority. Also, in no manner, or fashion, was there a “universal church” established or even hinted of. A lesson on the first church in Jerusalem, as recorded in Acts 2:41-47, will be forthcoming. “… was baptized:” The converts were baptized with physical water, being fully immersed, after salvation. Baptism is a solemn picture of the death, burial and resurrection of Christ; Romans 6:1-5 Baptism is one of the two ordinances given to the church. The church at Jerusalem is a perfect example of how baptism is to be accomplished after salvation, not before, and not a sacrament for salvation. The sacrament of infant baptism by the Roman Catholic Church, and the practice by the Church of Christ in order to be saved, are both grave errors and are not a New Testament church ordinance. “Now therefore ye are no more strangers and foreigners, but fellow-citizens with the saints, and of the household of God; And are built upon the foundation of the apostles and prophets, Jesus Christ being the chief corner stone.” Ephesians 2:19 & 20 John the Baptist, as a prophet, and the forerunner, and baptizer, of Jesus Christ, is included as the foundation of the church. A New Testament church will follow the baptism of John. The practice of sprinkling, or pouring, by the Roman Catholic Church, the Presbyterian Church, the Methodist Church, and any other church, is not a New Testament church method of baptism. Therefore, to reject the baptism of John the Baptist, immersion, after salvation, is a rejection of the counsel of God. Furthermore, the name of the individual who baptized the Lord Jesus was John. The title of John was, “the Baptist.” For a New Testament church who decides to fully follow as a disciple of John, and Jesus Christ, and call them themselves, “the Baptist Church,” is a good statement of where the church stands in relationship with John the Baptist and in doctrinal matters. Also, “ … and they were all with one accord in Solomon’s porch.” Acts 5:12. Solomon’s porch was part of the Temple at Jerusalem. The first church at Jerusalem met in the Temple at Jerusalem. The Temple was a physical structure, ordained by God Himself, for public worship. For a local church to met in a building, a physical structure, for the worship of the Lord Jesus as the head of the church is following the practice of the first church at Jerusalem. Therefore, the first church at Jerusalem assembled in a building. The common practice of Baptist assemblies calling the physical structure that they meet in a “Temple” is also in accordance to the assembly location of the first church at Jerusalem. ‘Church’ is in the singular as there was only one church in Jerusalem at the time of Acts 2:41-47 Therefore, the Jerusalem assembly was local. The preaching of the gospel, and the salvation of souls, and the addition to these souls to the church, continued on a daily basis. As a part of the foundation of the church, the Lord gave the apostles the doctrines of the New Testament that the assembled church was to believe and follow. As the New Testament was not fully written, the apostles were the instruments that the Lord Jesus used to keep the early church doctrinal correct. The so-called, Apostles Creed, is not the “apostle’s doctrine,” as written in Acts 2:42. Along with the other Apostles, the doctrines of the early church are more developed as Paul, Peter, James, and John, write their epistles through the direct inspiration of the Holy Spirit. The doctrine of the General Assembly, the Bride of Christ, the Body of Christ, brethren called saints, the church as part (not replacing) of the elect of God, are more fully developed, and understood, as the Apostle Paul reveals these other aspects of the church more fully. Until the complete New Testament is written, the local assemblies listen, and follow, the teachings of the apostles. Not one time do any of the Apostles refer to a ‘Universal Church,’ or a denominational headquarters. Excellent lesson Alan. I especially like this part: "Furthermore, the name of the individual who baptized the Lord Jesus was John. The title of John was, “the Baptist.” For a New Testament church who decides to fully follow as a disciple of John, and Jesus Christ, and call them themselves, “the Baptist Church,” is a good statement of where the church stands in relationship with John the Baptist and in doctrinal matters." This is something that most leave out of lessons and even just plain conversation. They never identify a Baptist church, in name, as being identified with John the Baptist. I have recently taught this concept, both in my church and here on OB. For a New Testament church to take the name "Baptist" is an affirmation of the lineage of the church that Jesus built. It also identifies with the teaching, ministry and person of John the Baptist. It is also not without great significance that John's title of "The Baptist". was given to him by The Lord himself: Mt 11:11 Verily I say unto you, Among them that are born of women there hath not risen a greater than John the Baptist: notwithstanding he that is least in the kingdom of heaven is greater than he. I appreciate you mentioning Matthew 11:11 and your comments. We will continue the study of the local church (churches), in the book of Acts by discussing Acts 8:1-3 and 9:19-31Both of these passages are connected with Saul /Paul before he was converted and after his conversion. I am grieved over the lack of doctrinal truth and spiritual discernment found in the majority of local churches today (e.g., false doctrines, bibles rarely being used, the name of Jesus almost never mentioned, worldly sermons, glorifying self, etc.). I would go as far as to say that nearly 90% of local churches (if not more) do not uphold to biblical truths; and especially not with what "church" has become here in the waning days of the Lukewarmness which abounds. It is typical of people who have adopted an easy and comfortable way of doing things not only to proclaim themselves "right" in their wrong-doing, but also to find fault with others who ARE doing it right. Why? Because such individuals challenge their comfort. Also, if they can get the people who are doing it right to do it "their way" instead, then they will feel much more secure in their wrong approach. This is, after all, how the devil got a third of the angels to join up: not only were they doing what they wanted to do (instead of doing the right thing) but with so many doing it there was safety in numbers. A third of the angels can't be wrong, can they? Yes they can. So many Christians going to church where the Word is NEVER taught or else is error is taught about it can't be wrong can they? Yes they can. Everyone should attend church, but why are we going there? If it's not to learn the truth and grow spiritually from it -- the whole reason for Christian assembly -- then we are only wasting our time . . . or worse (if what is being "taught" is contrary to the truth which is often the case). Churches today tend to be little more than social get-togethers, so that even though there may be differing in their formal creeds, really no one believes much of anything (anything of the truth, that is). So whether a church in question focuses on wowing the congregation with "worldly" music, or hell-fire and brimstone, or speaking in tongues, or extensive high ritual, what they have in common is no truth (or very little of it) and very often falsity instead. I certainly encourage every Christian to fellowship with other Christians who are likewise dedicated to the truth so that by such fellowship they may be encouraged and helped even as we encourage and help them -- and to bring Glory to God. That is what local churches of Jesus Christ is supposed to be doing -- and what better and more efficient way of doing so than face to face? Churches which teach false doctrines and damnable heresies are a dime a dozen these days, and those are lies. And we are not required to believe lies. Rather, we are to refute them with the truth. It's all about the truth, and that is a difficult commodity to come by in the vast majority of churches today . . . and they are very few and far between. The above quotation from you is the the same thought in one my future lessons on the local church. In one of my previous lessons I mentioned that the Lord Jesus is the invisible head of the local church: Revelation 1:11. Eventually, I hope, we will be discussing that all of the 7 churches in Asia, Revelation 1:11-3:22, were local churches. A lot of the churches in our age, as you said, are "... a little more than social get-togethers." I appreciate your comments. They are a helpful addition to this study. This reminds me of Mr. Osteen and his congregation where the Satan has sown tares in Christendom ("Christiandumb"). It seems pretty clear to me that there is at the very least very LITTLE (or ZERO) spiritual depth to his inspirational pep-talks. In this, of course, he is far from unique. Contemporary Christianity has elevated the sermon-format to the centerpiece of corporate "worship", and it has come to be a mere form of entertainment (if it was ever truly anything else). Mr. Osteen has merely packaged this church-o-tainment in a way that is apparently attractive for some people's tastes. But it is certainly the case that aspiring to pablum of this sort instead of solid spiritual food is not what any Christian who truly loves the Lord Jesus ought to be doing. The more one grows spiritually from careful attention to and belief in the Word of God, the more it becomes glaringly obvious when a particular teacher or brand of "teaching" is lacking in substance. Contemporary Christianity has elevated the sermon-format to the centerpiece of corporate "worship", and it has come to be a mere form of entertainment (if it was ever truly anything else). One of (there are several), the reasons why I started this thread is that I noticed two things. One of the reasons lies in the word "corporate." Denominations are like corporations. Businesses are operated in a "hierarchical" manner in order to grow a business. The "headquarters" of a denomination or a business is to run the church or the business. The Lord Jesus, and the Apostles, never started a denomination. All denominations are "hierarchical" in nature in order to perpetuate the denomination. A businessman understands the how, and why, a denomination operates. Baalam, heretics, the cults, denominational heads, inspirational preachers (men like Joel Osteen), are "covetous" and are are in the "religious" business. "And through covetous shall they with feigned words make merchandise of you. whose judgment now of a long time lingereth not, and their damnation slumbereth not." 2 Peter 2:3 These men, and women, are in the churches trying to promote themselves," merchandise," and their doctrines. One of the main reasons why inspirational preachers, and the Charismatics, have experienced great growth is they they realized that a lot of people want to be entertained in a religious or Christian environment. And, one of the main reasons why it is hard to convince the Charismatic brethren that their doctrine,and belief of the Holy Spirit is in error, is due to their emotional involvement in tongues. The denominational heads, and inspirational preachers, use this emotional involvement to make huge amounts of money. After the martyrdom of Stephen, Acts 7:54-60, Saul, with the direct authority of the Jewish religious leaders, enacted a period of great persecution against the saints at the church at Jerusalem. As the saints went into hiding, even in their homes, Saul brutally persecuted them. Except for the apostles, the saints from the local church at Jerusalem scattered. When the saints fled from the persecution of Saul some of them went to the region of Judea and Samaria. Judea is the region that surrounds Jerusalem and Samaria is north of Judea and Jerusalem. The saints that fled Jerusalem in the area surrounding Jerusalem preached the gospel and established churches in the various cities in the region surrounding Jerusalem. The saints that fled to the northern region of Jerusalem preached the gospel and established churches in the northern region. The assemblies of the saints were local, or regional, in location. On his second missionary journey, the Apostle Paul left the region of his local church in Antioch and traveled to the region of Corinth to preach the gospel and start a church. “To preach the gospel in the regions beyond you.” Every New Testament Church is “regional,” or “local” to the area that it assembles in. The church at Corinth was a regional or local church that was limited to its own area or region. The apostle Paul knew that the influence of a local assembly, in this case Corinth, was limited to a particular region; or local in scope and authority. In Acts 9:1-30 we witness the dramatic conversion of Saul the Persecutor to become Paul the Apostle. The King James Version reading of Acts 9:31 is very clear, “churches.” “Church” is singular and “churches” are plural. As mentioned before, the King James Version not only says “churches” but it also lists three distinct regions that the churches existed: Judea, Samaria and Galilee. The article does not specify a particular writer, nor does it specify a particular version, nor a particular Greek manuscript. The website creator is a para-church ministry of Mr. S. Michael Houdmann. Houdmann is a graduate of Calvary University and Calvary Theological Seminary, Kansas City, MO and uses the modern versions extensively. F. H. A. Scrivener’s Greek translation of the Textus Receptus, in Acts 9:31, gives the plural translation of the Greek word: plural: αἱ … ἐκκλησίαι . Therefore, the King James translation is correct by word and description: the ‘churches’ plural, had rest after the persecution by Saul ceased. Scrivener, F. H. A., M. A., The New Testament, (The Trinitarian Bible Society: London, England), Cambridge University Press 1894 and 1902. Page238. Thank you Alan. I love maps when used in conjunction with proper teaching. They just make the lesson come alive when you can actually see the places mentioned. I liked your Scripturally correct points on the proper rendering of both the word, church and churches. This proper teaching regarding Acts 9:31 is but one instance (and a very important one) that shows the fallacy of any kind of argument for "Universal Church". The statement of gotquestions, org that said; "should actually be the singular church" is not only in error, but also shows the blatant disregard for the inspired writing of the Holy Spirit himself. We can just lump that kind of statement into the "bible changers" category. These people are proud boasters in presuming to be able to interpret Scripture better than the original interpreters of the bible. I appreciate your comments Jim. In a study like this one the maps are useful. I would recommend all of the brethren get a good Bible atlas. I have noticed before (in this study and others), the blatant disregard by para-organizations, denominational material, inspirational preachers, numerous Bible scholars, internet theologians, and many others, of the clear words of the writings of the Holy Spirit in scripture on a doctrine. Nearly all churches outside of most Baptist denominational churches are absolutely CLUELESS as to what biblical preaching entails. They all have nothing to do with helping their congregation to grow by preaching in one way or another, that is, proclaiming, instructing, sharing, explaining the truth of the Word of God. The problem is with what the English word "preach" means today to most, and "preaching" today is nothing more than fables to tickle the ears of those who in their hearts actually resent the truth. In fact of course, "preaching" in most churches has almost nothing whatsoever to do with the Bible. "Preaching" is generally a short and highly rhetorical tour de force wherein the preacher attempts to use colorful and emotive words, rhetorical flourish, emotional manipulation, a booming and/or lilting voice, and a dramatic presentation to impress those listening (e.g., T.D Fakes, Pastor Creflo "give me a dollar", Joseph Prince, et al.). In this case, I would rather listen to teaching. Because teaching on the other hand, could care less about impressing people as long as the information is communicated effectively. Good Bible teaching always results in those listening learning something about the truth and thus drawing closer to the Lord. So preaching (as the word is understood today) is a concept foreign to scripture, and the present day practice of "preaching" is inimical to good teaching. But many people find it enjoyable and many preachers find it capable of inducing guilt and other unhelpful emotions, wrongly directed (which can lead to greater donations, etc.). Besides the work of the church, I am now involved in the collecting, and double-checking, of a series of lessons that I did previously here on Taiwan, in Chinese, on "The Biblical Gift of Tongues" in order to print the series into book form in Chinese. It is a daunting task that is taking up almost all of the time that I can spare. I have not forgotten this study on the local church. I hope to continue this study next week. I thought I would give an example of how a true New Testament church conducts their worship music. “And when he had landed at Caesarea ...” The Apostle Paul finished his boat trip in Caesarea. “… and gone up …” is usually meant that he went up to Jerusalem. “… and saluted the church ...” If he went 'up' to Jerusalem, he 'saluted the church.' As discussed previously, the number of local assemblies in Israel were numerous even before Paul's completion of the second missionary journey. So, at this point in the early church the individual assemblies were more numerous. The very context of the word 'church' expressly shows us that, whether in Jerusalem or not, the church was a local church and not a 'universal' assembly of all the believers. I would also like to point out another fact. There is not even a 'council' that the Apostle Paul attended. Apparently, there was no need for another 'council' to convene in the early church at all. In reporting back to the churches in Israel no denominational board of any sort or manner, nor an universal assembly of all the believers, nor a council, is mentioned or inferred too. I agree Alan. Any reasonable person would understand that "the church" that Paul saluted was his sending church at Jerusalem. It certainly was not some universal church represented by any convention or denominational board. It is amazing to me that anyone can study their Bible and come to any kind of conclusion regarding how missionaries are sent out and how they are to operate in an exclusively local church setting. We do not read one time where any missionary was sent out from, or reported back to, any mission board or convention. In every instance the interaction between both missionaries and church was local in nature. I guess I am just a hard nose in this respect; the authority to send men to any mission field resides exclusively in the local church. Denominational mission boards have no authority.